Well, weddings can take place any time of the year, even in the coldest of cold winters. (Yes, that is a trend, these days!) But, we don’t hear brides being associated with any other month, as much as with June! So, we have to conclude that June is perhaps the most popular month for weddings, and it goes without saying that this is because summer weddings have and will always be a huge thing. We love weddings, whichever be the month that they are held in. Whether summer, spring, winter or autumn, a wedding is always a special event. Having said this,we must also say that we have this soft corner for summer weddings, and with good reason too! In fact, we have ten reasons why we, and the rest of the world, think summer weddings are great! Let us look at what they are. The longest days of the year are in summer, and this gives you ample time to enjoy our wedding day without worrying about how early the sun will set and it will be best to dismiss the party. With the sun taking its own sweet time to go to sleep, sunset weddings can be held late in the evening. This allows both the wedding party and the guests plenty of time to get dressed and reach the venue. The best thing is that you can plan your ceremony late in the evening, and not trouble your guests with having to leave work early in the day, to make it on time. The same goes for you too. Take your time to perfect your bridal look, for there is plenty of time. Summer is also the ideal season to plan a non-traditional outdoor morning ceremony. 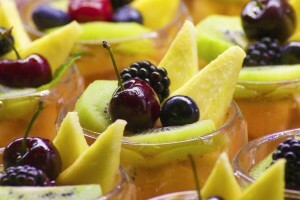 Wedding brunches that are over before the sun gets too warm are a perfect budget option, that is both casual and fun. Take a look at our bridal gallery and you will soon observe that most wedding dresses feature sweetheart and strapless necklines. Many wedding designers bring out plenty of dresses that feature sleeveless and strapless necklines, and this has been the trend for a while now. However, it isn’t a great choice for when the weather is cold, as you will be forced to find an option to cover your arms, at least temporarily. With summer weddings, you don’t have to worry about this at all. With the warm weather, you couldn’t be more comfortable than in a dress without sleeves or straps. And this allows you to choose from a greater range of options, and find the dress that fits your vision perfectly. Since there are countless choices in soft, airy and breathable fabric, you won’t have much trouble finding a dress that keeps you comfortable during the day. More on wedding fabrics and how to choose the right one, in our previous post here. As the sun smiles down and the flowers are in full bloom, there is a certain joy in the atmosphere that is not found in any other weather. Summer is so full of joy, and weddings being a celebration of love and happiness, there couldn’t be a better time for it. Your guests will also be eager to step out of their homes and enjoy your wedding. This is irrespective of whether it is held indoors or outdoors. The longer days make everyone active, and they will be eager to attend your summer wedding than battle the snow and make it to a winter wedding ceremony. Now, haven’t you noticed how people like to pull out the most colorful clothes to wear during summer? We think that as the weather becomes warmer, there is a general tendency to shift from the light and pale wintry colors to deeper and brighter colors that reach their saturation levels in summer. Soon afterwards, autumn arrives and the color palettes again recede in intensity, moving towards light or neutral tones. So, if you want a bright and cheerful crowd who will liven up your wedding atmosphere and photographs, you simply have to plan your wedding in summer. Summer is the season when you have the best of farm produce to spice up your wedding menu. If you go local or with the seasonal variety, you still have so many options. Nature’s bounty is lavish in the warm summer months, with produce like squash, pumpkins and other colorful fruits and vegetables in abundance. Not only does this allow you to plan a spectacular and vibrant wedding menu, it also allows you to do this without costing the bank. Another thing to remember is that summer weddings allow you to hold a daytime function like a brunch buffet easily. These are cost-effective options where you can serve delicate and light food that will be satisfying and interesting, and it will be much cheaper than a full-course plated dinner. Since the weather will be warm, your guests may not appreciate a heavy meal. This will work in your favor as you can focus on appetizers and drinks, instead of expensive desserts and rich main courses. With schools off for summer and many families planning their holidays at this time, it is a lot easier for people to attend your wedding. If you have invited children, their parents will appreciate attending the wedding at this time of year. This is because the children will be free without having to rush through a hasty weekend wedding to get back to school on Monday. Now, if children aren’t attending, it is still easier for the parents to arrange child care for them. Many of them may already have arranged for a babysitter while they are at work, and it makes sense to simply extend the service to your wedding day without much ado. It is also a known fact that many people choose to go on annual leave during the summer, and with prior notice they can plan to attend your wedding, and adjust their vacation plans accordingly. It also helps your friends or family in university, as they will mostly have their annual break in summer. When you get married in June, it is closer to the holidays, and this allows you more time to leave town and enjoy an extended honeymoon. That is, unless you’re just engaged and plan to have your wedding right away! But, barring this circumstances, we think summer weddings are the most practical weddings. If you have a year or whereabouts to plan your wedding, you can take your time to plan your wedding look, do your dress research and decide on your wedding décor by winter. 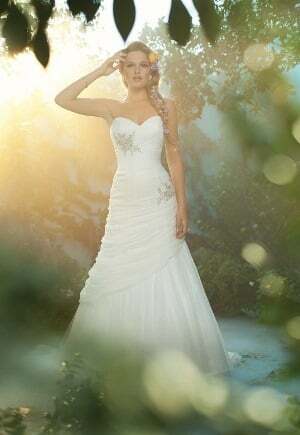 You can even place your wedding dress order before spring, and still have enough time to get the alterations done. Come spring, you can go shopping for all the other things you need for the wedding, place all your orders and book everything you need. The pleasant spring and summer weather will allow you to easily meet your appointments, and do all your last-minute tasks without worrying about frozen roads, snow or unexpected blizzards. With so much time on your hands, you could even plan a destination wedding easily. Nevertheless, we always suggest sticking to a wise and well-planned wedding timeline, so everything progresses as per plan. Here is a wedding checklist that can guide you in this direction. Follow it and make sure you are all set for your wedding. Like we said earlier, summer is the right time to have a destination wedding. Your choice may be an exotic beach far away from home, or even a venue in the adjacent town. All the same, this is the right time to plan a wedding a little away from home, because you can afford to make the most of the warm sunny weather and travel far for the biggest celebration in your life. Planning time off work is practical in the summer months, and it will also be easy for your chosen guests to attend your wedding as this is the popular vacation time. Many exotic destinations offer special wedding packages this time of the year. You may be able to book your honeymoon stay at a reduced rate, or club it with the wedding venue costs. Getting married on the beach, where surf and turf meet, with warm salty breezes punctuating the air—it is a fantasy come true for many couples, and summer makes it possible. If you are a bride who is excited about flowers, summer is the perfect time for you to plan a wedding with plenty of floral details. The most popular wedding flowers–lilies, gardenia and carnations, are in full bloom during summer. This not only makes bulk ordering budget-friendly, but is also is an eco-conscious decision. When you choose to have these flowers in any other season, they are usually shipped to your location from greenhouses in other parts of the world, where they bloom at the given time. This can not only be expensive, but is also very unfriendly on the environment. Summer makes it possible for you to explore the several options in locally available and seasonal flowers, and you will have ample variety to choose from. This article on the Flowerexpert blog will enlighten you on the several flower breeds that are available in the warm sunny months. Take a look at it, and you will soon realize how right we are when we say you have no dearth of options. So, if you want your wedding décor to be filled with blooms of different varieties, colors, sizes and designs, you simply must have a summer wedding. And we are sure it’ll be spectacular. Most brides would love to look tanned and beautiful on their wedding days. Getting a real tan is close to impossible in the winter, autumn and even spring. You would either have to opt for the services of a tanning salon, use tanning spray or fake tan. But we all know that none of these come close to the real deal. Fortunately, with summer, you have the perfect situation to do this with the help of mother nature itself. Spend a stress-free afternoon at the beach, or simply rest in your own backyard, and you will have that magical tan before you know it. And, there is no doubt that a bride with a tan looks fantastic in a beautiful white wedding dress. So, make it happen with a summer wedding, beautiful brides! With more weddings held in summer, couples turn to the various businesses available locally for their various wedding needs. From florists, to bakers, venues, makeup and hairstylists, photographers and transport companies, all the local businesses see their revenues go up in the warm summer, thanks to the wedding clientele they host at the time. Since the demand for vendors is usually highest this time of year, most business owners are happy as they have a better chance of doing good business. So, it simply means that not only do summer weddings make the couple themselves happy, they also help the local businesses enjoy the best part of the year with more profit and business. With everyone happy, it is a joyous occasion in every way. So, there you have it—summer is a fantastic time for a wedding, and undoubtedly one of our favorites. If you have your wedding lined up in the warm months this year, don’t forget to visit us at Best for Bride to find all that you need for your dream wedding. From wedding dresses, to dresses for the bridal party, wedding cakes, invitations, party favors and more, we have every wedding aspect covered under one roof. You are correct that you have much more options for a dress during the summer months. That is the reason I am doing mine in the summer.